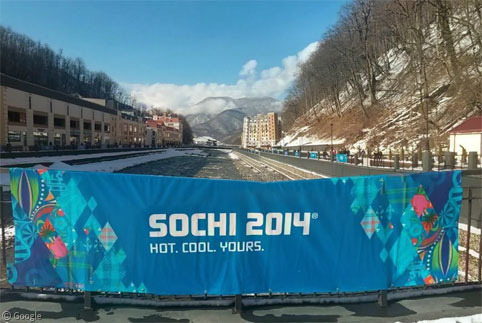 A year ago we previewed the venues which were under construction for the upcoming Winter Olympics and Paralympics in Sochi, Russia. 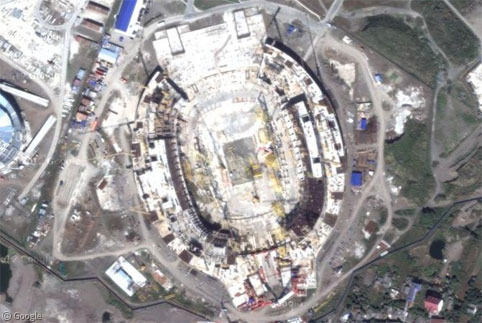 With the Opening Ceremony taking place on February 7th1 – to be followed by the Paralympics Opening Ceremony on March 8th – we can look at the now-completed venues on Google’s updated satellite imagery of the coastal and mountain venues. 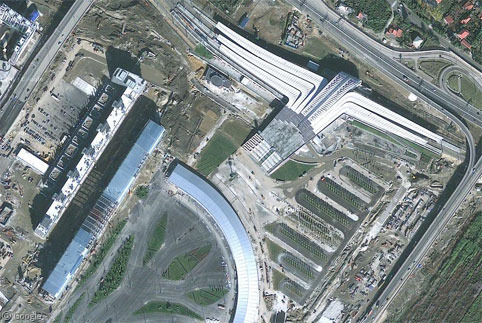 The coastal cluster is near Sochi Airport; it includes six venues, a medal-presentation plaza, the Athlete’s Village and the International Broadcast Centre. 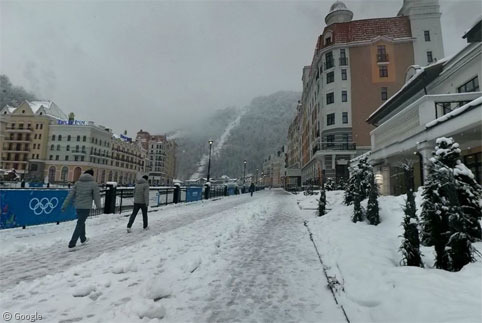 A photo sphere creator – Владимир Жабин – in Russia has created panoramic views in a couple of locations, allowing us to get a ground-level look at the venues in the absence of Street View coverage. 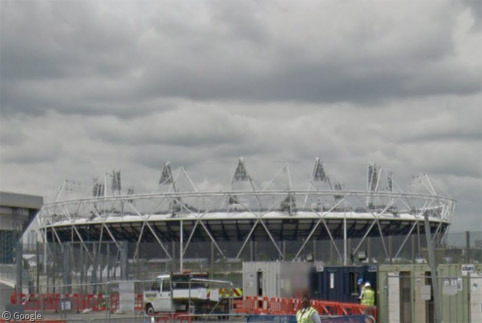 The central plaza which will hold 20,000 people for nightly ceremonies and which includes an inclined tower which we think will be topped by the Olympic flame for the duration of the Games. 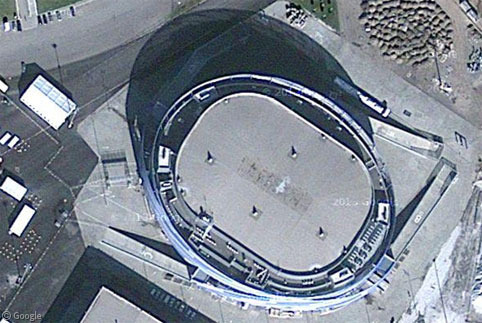 The tower is quite similar in design to the one at Montreal’s Olympic Stadium. 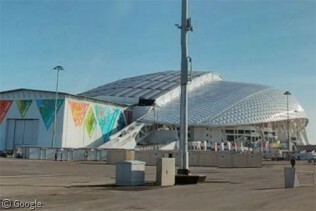 Ceremonies will take place at the 40,000 capacity shell-like Fisht Stadium, which will also host some matches of the 2018 World Cup. 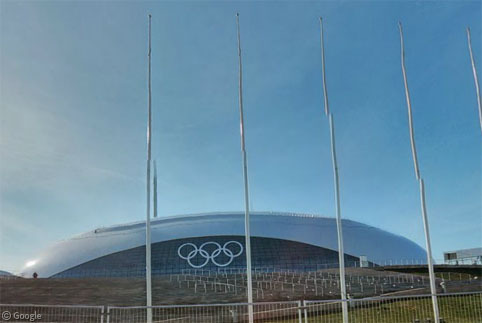 … though the most important games will take place at the larger and permanent Bolshoy Ice Dome which is just next door. Continuing around the plaza we come to the Ice Cube Curling Centre, another temporary venue which doesn’t look very cube-like from this perspective. 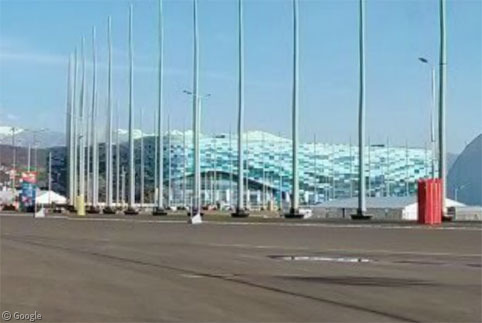 Long-track speed skating will take place at the Adler Arena Skating Centre, which includes windows allowing spectators inside to see the mountains off in the distance. 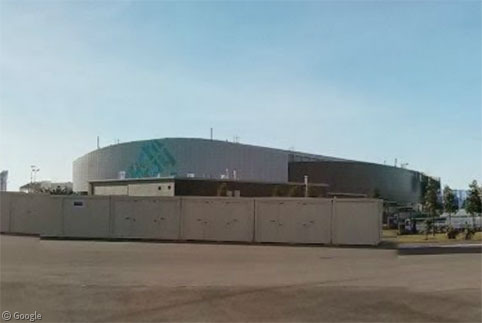 The final competition venue in the coastal cluster is the Iceberg Skating Palace which will host figure skating and short-track speed skating. 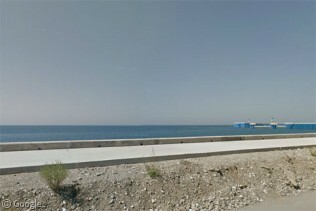 Athletes and team officials from 88 countries will be housed in new accommodations built to the north-west of the plaza, and along the coast, where some of them will have quite a nice view of the Black Sea. 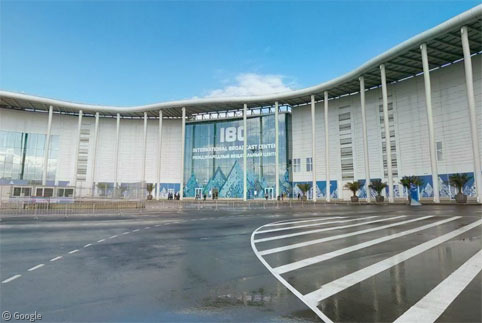 The world’s media will work at the International Broadcast Centre which is to the north of the plaza. 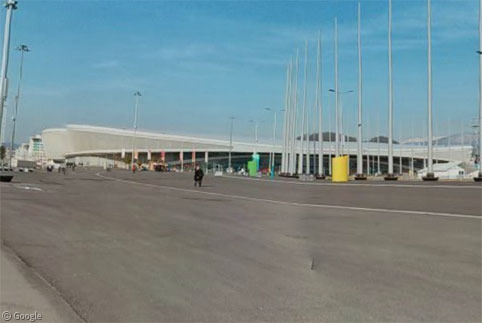 Visitors staying outside the main coastal cluster will mostly arrive by train at a new station, then proceed though the ticketing and security checkpoint before continuing into the plaza. 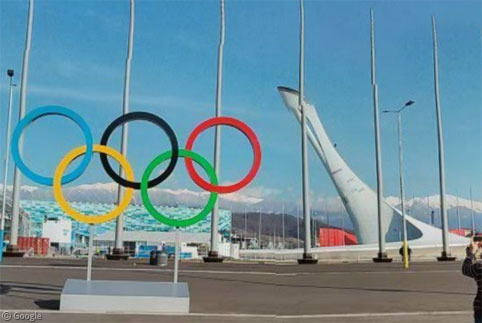 The mountain cluster of five snow-sport venues is about 40km inland from the coastal cluster. We mentioned a year ago that snow was being manufactured and stockpiled under insulating blankets in case this winter didn’t bring enough snow. 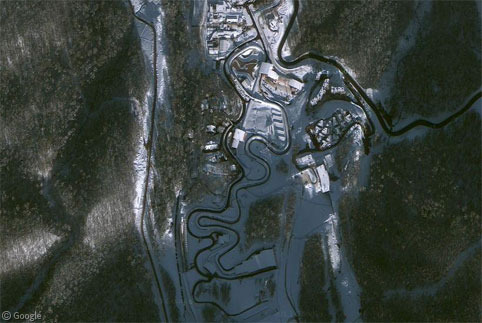 However, in the recent satellite imagery there appears to already be a good accumulation, such as at the Rosa Khutor Extreme Park where freestyle skiing and snowboarding will take place. 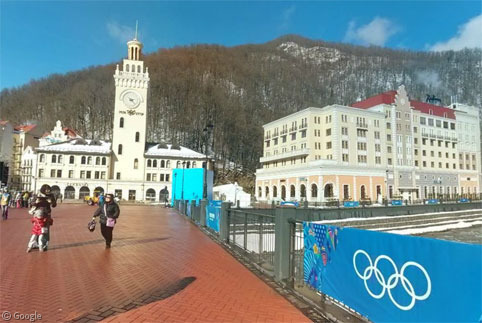 Downhill ski races will be held at the nearby Rosa Khutor Alpine Resort, where we can see the stands for 8,000 spectators nearing completion. 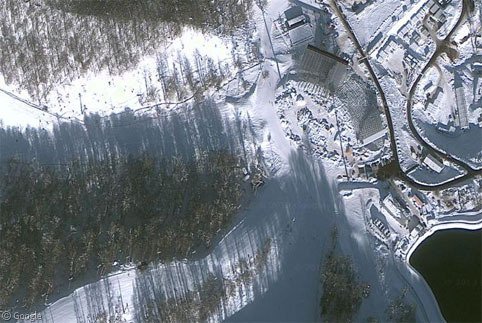 The Laura Biathlon & Ski Complex will host cross-country skiing events. 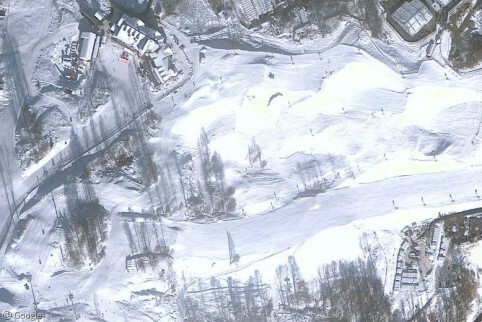 The RusSki Gorki Jumping Centre is somewhat hidden in the mountain shadow, but we can make out the two jumps, landing areas and seating. 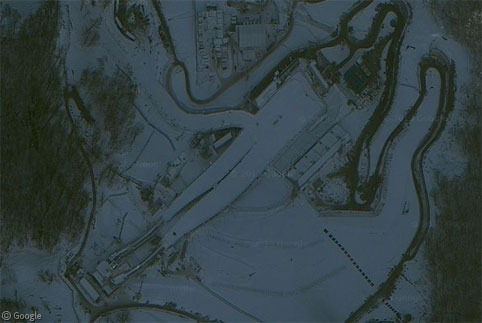 The sunlight at the Sanki Sliding Centre reveals the sinuous curves of the track used for bobsleigh, luge and skeleton. 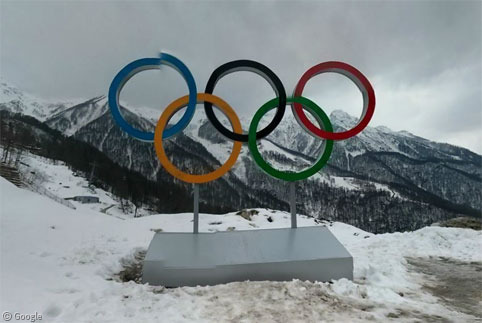 A few photo spheres created by Михаил Тепляков allow us to see some locations around the mountain cluster, including this large set of Olympic rings with a lovely mountain vista behind. The scenic main square of the village. Confusing marketing slogans. “Hot. Cool. Yours”? And finally, more evidence that there is plenty of snow. 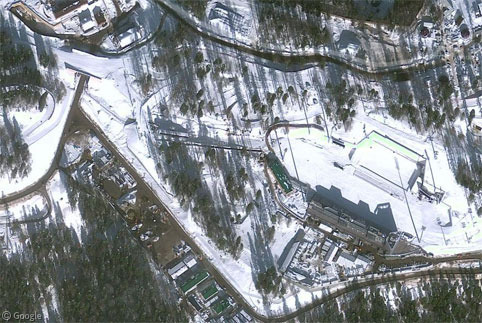 And if you enjoy this last image you’ll love our recent post about Google Snow View.